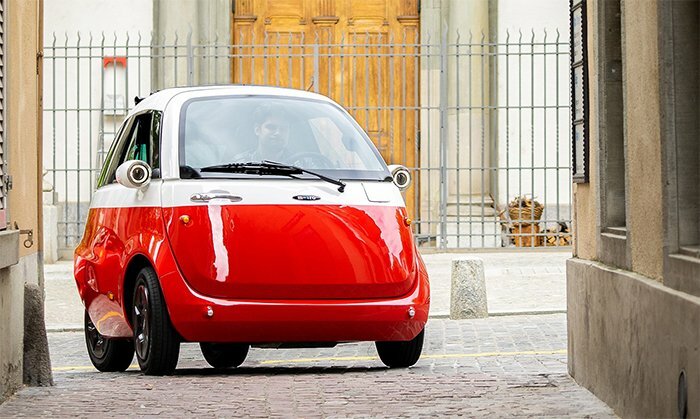 The Isetta-style Microlino electric bubble car surpasses $100 million in pre-orders. The sustainability of conventional transport systems is a huge concern to the major players in the transportation industry. On one hand, there is the problem of carbon emissions and its environmental impacts. The growing car density in the urban centers presents a different but equally important challenge. Traffic congestion has made commuting a nightmare and finding space in a parking lot has never been more difficult. All stakeholders agree that there has to be a paradigm shift in the way we think about cars and commuting if these problems are to be resolved. The Microlino is one of the bold innovations that attempt to solve the problem. The first thing that strikes you about the Microlino is its compact and chic design. The car typically occupies less than half the space your smallest conventional car would occupy, living up to the ‘micro’ tag. The car weighs 435 kg and has a length of 2.4 meters. This makes it ideal for cross parking. In addition, a front entrance enables you to exit directly on the sidewalk. This would go a long way in solving the car density problem on urban roads. You would spend less time in traffic and even less time searching for an ideal parking space. The Microlino is an electric car that is unlike most others. You can recharge the battery at any conventional power socket and it only takes four hours to achieve a full charge. If you can get a Type 2 connector, the charge time reduces to one hour. When you charge with renewable energy, the net carbon emission of the Microlino is zero. This is in line with the manufacturer’s aim to reduce the carbon footprint of cars all over the world. Even with the compact design, the Microlino boasts amazing functionality. At full charge, it has a range of 125 or 200 kilometers depending on the battery size. And the car is not slow either. Its top speed of 90 km/h is higher than the speed limit in most urban environments. The Microlino can accommodate the driver and another passenger, making it the ideal vehicle for commuting alone or with a partner. You can also take the vehicle on your cruise to the beach or sports club. The trunk is reasonably large and it can effortlessly accommodate your kits. Although the Microlino is yet to launch, there is a great deal of buzz surrounding the car already. It was recently approved for street-legal status in Europe, and is now headed for production. There have been more than 8,000 pre-orders already with the bulk of that figure coming from Germany and Switzerland. Fans seem to be excited about the Microlino’s design and promising features and the general acceptance bodes well for the transportation industry at large.